Our planet is a fascinating subject. This explains why everybody loves National Geographic. Earth in 100 Groundbreaking Discoveries often made me think of NG - although published by a different crowd, it is very similar in tone and focus. No ads, though! The book presents a mixture of disciplines. There's some geology, some paleontology, enough astrophysics to explain our planet in cosmic perspective, some anthropology... Well, let's just say it contains many different -ogies, all united in the purpose of teaching a reader more about the Earth. All the scientific stuff is presented in approachable manner, suitable for novices. The book includes some fancy words, but they are all conveniently explained, so you don't need a Ph.D. to enjoy it. I have to confess I caught myself drifting off from time to time, but my mind is strictly non-technical and does not process experimental science easily. The book is not to blame. 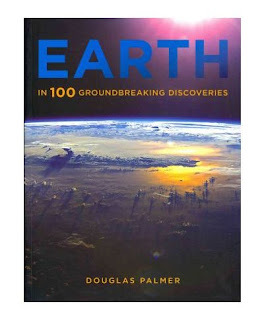 More praise: Earth in 100 Groundbreaking Discoveries is a visual masterpiece. Stunning pictures printed on good quality paper, it is almost an album. I'm not sure how groundbreaking the discoveries really are, but they surely are up to date. In most cases, Palmer quotes research from 2010/2011, which is very fresh in this type of publication. Overall - a tasty serving of science for amateurs. Worth reading, worth recommending.